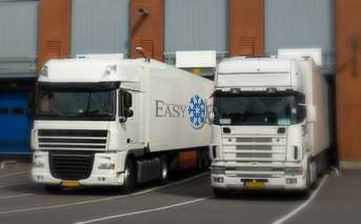 Easyfresh offers transport solutions from A to B anywhere in the world under temperature controlled environment. Easyfresh is focused to fresh and frozen cargo logistics. Besides it, we are 100% neutral and independent (not trading and not linked to any carrier or shipping line). We operate, own or subcontract coldstorages and add inland distribution, clearances and other value added services to the seafreight. Reefer Logistics is the synchronised Management of procurement, production, sales and distribution of perishables with its demands. It adds our customers corporate competitiveness and allows an increase of corporate value by reducing supply chain costs and reducing total transit times. On our customers behalf, whether they are producers or receivers, Easyfresh plans, implements and controls the efficient transportation, storage and distribution of temperature controlled goods. This includes all required inland and seaborne services and, linked to those, a constant update of information from point of origin to the final consumption point. Easyfresh seeks the best available combinations and solutions for our customers by having a “fresh mentality”. For example ; it is important to emphasize that the shortest seaborne connection is not necessarily the shortest route on a door to door basis. By all means, the perishable industry has gone global. As a consequence, Easyfresh, being a global reefer operator, understands the broader needs of our customers and attends their needs everywhere. Easyfresh fulfils their requirements for chilled and frozen cargoes transportation, linking producers and receivers based around the world. For future generations, we have the task to transport goods finding environmentally friendly solutions. Several Easyfresh customers are very conscious of it and require serious logistics suppliers focussed to environmental aspects, reducing CO2 emissions. Easyfresh provides safety and peace of mind to producers and receivers by maximizing security meassures, aiming to reduce all type of risks during transportation. Expertise and proper product handling throughout the transport chain and collection and distribution processes, lead to an improved safety, in an efficient way. Easyfresh is a network formed by Experts in perishable cargo handling. Being a service provider for the perishable industry, people are Easyfresh main asset. Easyfresh network team mates develop their activity in sound working environments throughout the globe. We offer our customers door/door, door/port, port/door, using any viable transport mode (port/port is not a goal).